One of the music industry’s greatest guitarists has recorded a special iTunes Podcast Playlist for his charity. 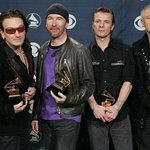 After Hurricane Katrina devastated New Orleans and the Gulf Coast in 2005, U2‘s The Edge knew something had to be done to preserve the rich musical heritage of the region. Along with producer Bob Ezrin and Gibson CEO Henry Juszkiewicz, he co-founded Music Rising, a charity dedicated to replacing the instruments that had been lost or destroyed in the storm. Now more than ever, Music Rising is committed to keeping the region’s unique musical culture alive through its continued support of education and the musical community. In a new exclusive iTunes Podcast Playlist, the Edge shares some of his favorite songs from New Orleans and the Gulf Coast, reminding us that much of today’s music originated from a musical culture that we must fight to preserve for future generations. Click here to listen to the free podcast on iTunes, where all 21 songs are available for download.